The HP-65 was a stunning calculator. Just 18 months after introducing the first pocket calculator with transcendental functions, HP introduced a pocket calculator that was programmable with a magnetic card reader/writer. The HP Journal introduced it as "The Personal Computer" long before that term had become common. At the time, if people had any access to a computer it was probably via a keypunch machine. To this day, the HP-65 is impressive - even to HP 48 users. Users could write programs up to 100 lines in length and record them on blank cards, or they could buy pre-programmed cards. These tiny cards (see pictures) had magnetic media on one side and a writable surface on the other. After passing a card through the calculator, the card could be slid into a slot just above the top row of keys where the writable side of the card served as key labels for the calculator's five program-defined keys. 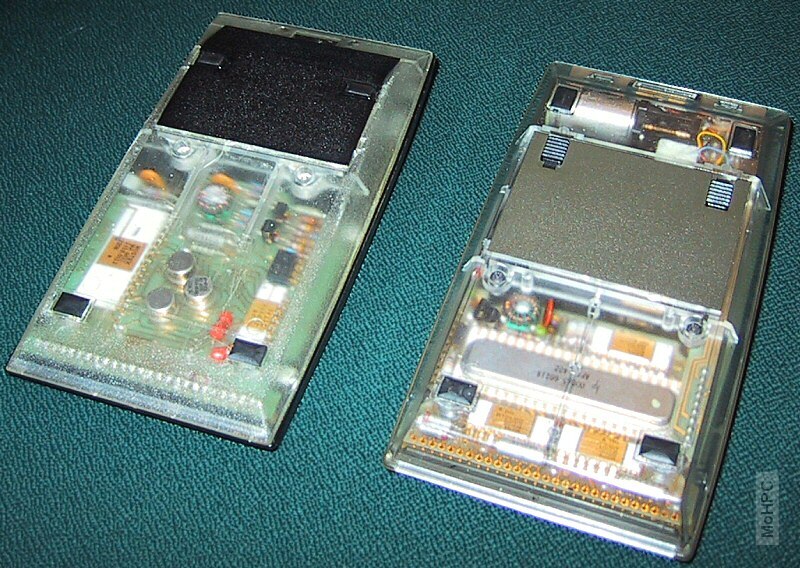 The HP-65 was housed in a case that looked much like the HP-35, but it was really slightly larger and very different to accommodate the card reader. If you look at the picture, notice how the silver band now goes around the display rather than below it. This little change kept HP-65's from looking prematurely old due to silver rubbing off when the calculator was switched on. The HP-65 had up to 4 functions per key. The normal function, a function printed in gold on the keypad above and a function printed in blue on the slanted front key surface. (This was the first appearance of the "tall" HP keys which continued to be used for years.) The fourth function was accessed using the f-1 key which produced the inverse of the f key. (e.g. f-1 LN gave you e^x.) This allowed HP to get four functions per key without a lot of clutter. 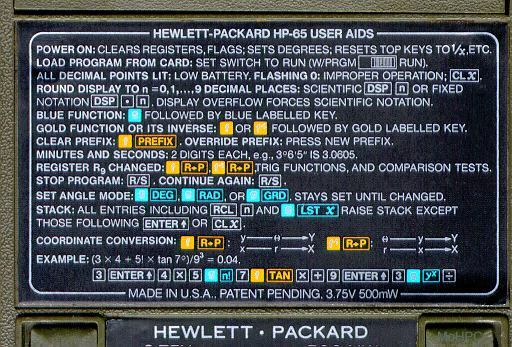 The HP-65 had 100 lines of space and used label addressing. Each instruction word was 6 bits long allowing for 64 distinct operations. Some, but not all, multikeystroke commands were merged into one line. On the HP-65, a function was called simply by invoking its name: (i.e. "A" called a function labeled "A".) Valid label names were A-F and 0-9 but since 0-9 by themselves were interpreted as numbers rather than function calls, you could only use A-F as function/subroutines. (0-9 could be used as the targets of gotos.) Two flags were provided as well as four conditional tests: x!=y, x<=y, x=y and x>y. There were also operations to split numbers: INT truncated after the decimal and f-1 INT preserved only the fractional part. 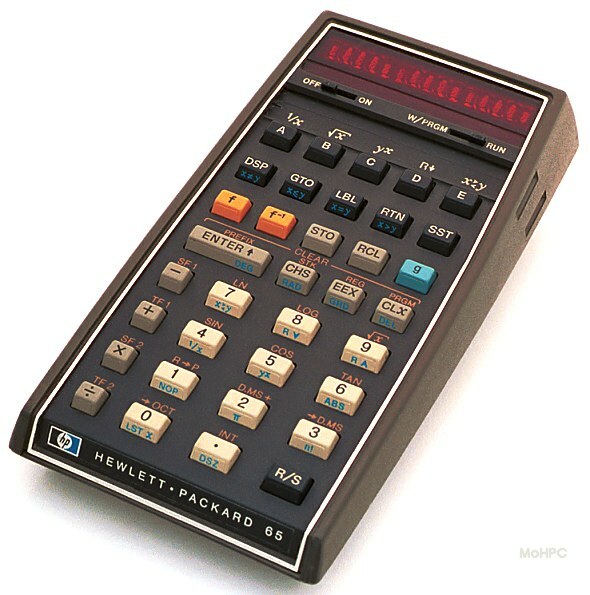 The HP-65 was the first HP pocket calculator with base conversions (but only octal and decimal). It was also the first to directly perform degrees.minutes seconds arithmetic (D.MS+ and D.MS-). An HP brochure from 1974 proclaimed "This man is holding the smallest programmable computer ever". "HP-65 in space with Apollo-Soyuz. The American astronauts calculated critical course-correction maneuvers on their HP-65 programmable hand-held during the rendezvous of the U.S. and Russian spacecraft. Twenty-four minutes before the rendezvous in space, when the Apollo and Soyuz were 12 miles apart, the American astronauts corrected their course to place their spacecraft into the same orbit as the Russian craft. Twelve minutes later, they made a second positioning maneuver just prior to braking, and coasted in to linkup. In both cases, the Apollo astronauts made the course-correction calculations on their HP-65. Had the on-board computer failed, the spacecraft not being in communication with ground stations at the time, the HP-65 would have been the only way to make all the critical calculations. Using complex programs of nearly 1000 steps written by NASA scientists and pre-recorded on magnetic program cards, the astronauts made the calculations automatically, quickly, and with ten-digit accuracy. The HP-65 also served as a backup for Apollo's on-board computer for two earlier maneuvers. Its answers provided a confidence-boosting double-check on the coelliptic (85 mile) maneuver, and the terminal phase initiation (22 mile) maneuver, which placed Apollo on an intercept trajectory with the Russian craft. Periodically throughout their joint mission, the Apollo astronauts also used the HP-65 to calculate how to point a high-gain antenna precisely at an orbiting satellite to assure the best possible ground communications. The first fully programmable hand-held calculator, the HP-65 automatically steps through lengthy or repetitive calculations. This advanced instrument relieves the user of the need to remember and execute the correct sequence of keystrokes, using programs recorded 100 steps at a time on tiny magnetic cards. Each program consists of any combination of the calculator's 51 key-stroke functions with branching, logical comparison, and conditional skip instructions." The HP-65 came with a spiral bound manual and a smaller spiral bound quick reference. In contrast to the HP 48, where programming is confined to a chapter at the end of the book, the HP-65 manual had the user enter their first program by the fourth page of the introduction. The 65 came in a nice black leather case like previous HP's. This one had a pocket where you could keep the quick reference guide, program cards etc. 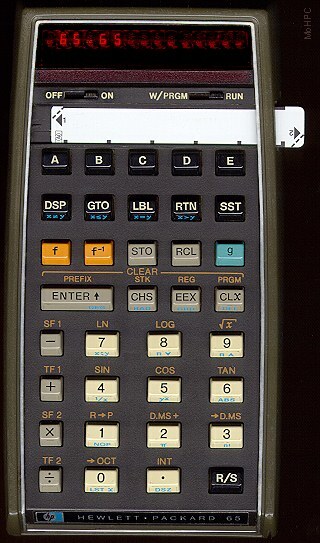 Richard Nelson created the HP-65 Users Club to exchange information on the amazing new calculator. The club was later renamed the PPC (Personal Programming Center). The PPC went on to support other calculator users and eventually released the PPC ROM for the HP-41C - a tiny ROM with a manual the size of a telephone book. 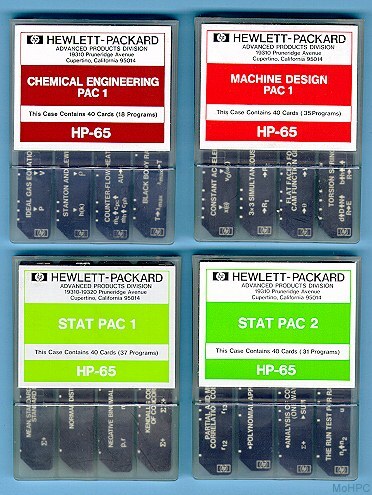 The following pacs contained up to 40 magnetic program cards, a manual, and 20 pocket card holders. 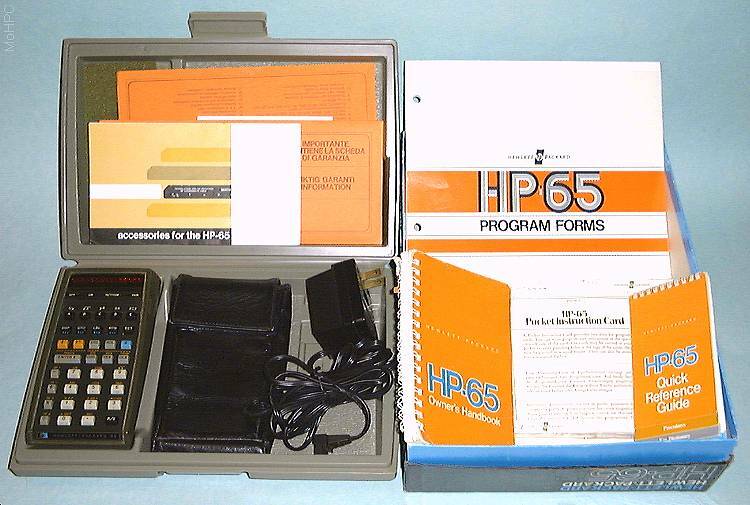 The HP-65 User's library made thousands of additional programs available. Early prototype card reader (~84K) It was originally believed that a metal frame would be required for stability. Bob Taggart's card reader parts. 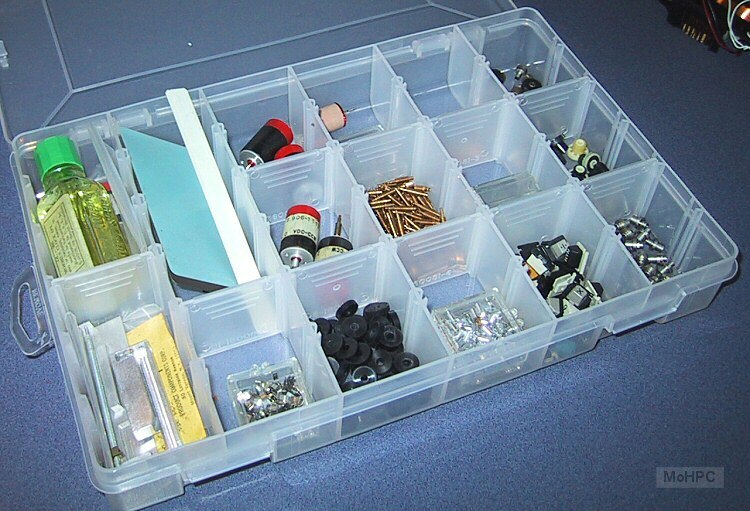 (~165K) These are the parts that Bob kept after designing the card reader. Clear cases (~230K) Because these calculators were developed without computer-aided-design, these were made to provide a clear view of how everything fit together.